The music of Sanna Ruohoniemi is jazz. It includes set pieces and improvised songs. This is her second album. The title track, Start from Nothing, has been released as a single and it’s a beautiful example of modern vocal jazz. If your favourite brand of music isn’t jazz, if you’re unfamiliar with what is surely this broadest of genres, Start From Nothing is the perfect envoy for the album and indeed for the genre. It’s possible this music could at once put you on the back foot whilst tapping the other. Start From Nothing contains wonderful musicianship, beautifully subtle production and luscious chord changes and melodies. The production on this recording is sumptuous. The bass is full and deep, you can sometimes hear the strings against the neck of the double bass during the title track. Sanna’s strong, undulating voice is complemented throughout by the sounds of drum sticks colliding, the natural reverb of brushes against tight tom-tom skins and the glissando double-bass during the seemingly improvised accompaniment. 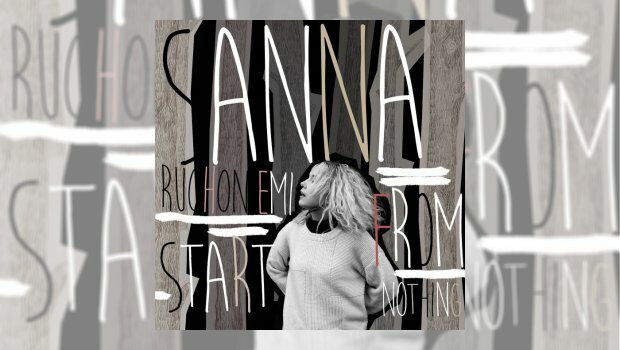 I think Sanna’s singing voice is perfect for this genre. An undercurrent of accent gives a vaguely but delightfully exotic feel to her phrasing. Sometimes singing in her native tongue but also in English she wraps her voice around a non-native language in a way that gives a beautiful inflection. Some singers would love to have this quality, and they do try. In places she duets and harmonises with the instruments in such an accessible way that you feel it would be easy to sing along, though I am in no doubt that this gives a false impression of simplicity and belies the underlying skill. It is so much more refreshing than hearing the vocal tricks that I have come to associate, no matter how unfairly, with modern music. This album is blissfully free of ‘cracked voice’, or vocal gymnastics so common to female singers, overshadowing the song content. Sanna’s voice is an instrument that perfectly complements her music and consequently there’s no need for such crass affectation. It isn’t all easy listening, though. In contrast to the more accessible opening tracks, the tightly wound third track, Over the Line, shows strictly disciplined and coordinated voice and trumpet and as the album progresses more and more improvised sections emerge, but I suspect that this album is, perhaps, more meticulously structured than its later improvised sections would suggest. Evidently, every component seems an important part of the whole sound. Nevertheless, in places, improvised it clearly is. I occasionally felt somewhat lulled into a false sense of security and that is a good thing. Whilst there is an experimental undertone running through the whole album, Day Of Thirst felt way more improvised and less structured giving it a slightly eerie somewhat disconcerting and oddly disturbing vibe which, paradoxically, I found refreshing. I can’t say it is my ‘go to’ track, though. In complete contrast, Bakom Fasaden (Behind the Façade) seemingly veers off to a different place, demonstrating what a diverse genre we’re listening to. In my mind Bakom Fasaden is a place occupied by people in evening dress, the sound of champagne flutes heard clinking above the sound of polite conversation as people, the band a backdrop to their evening, are seated around tables experiencing the smooth sound of a band who, in turn, is oblivious to its own surroundings and grooving away around the song’s hook. On first listen I found I’m The One (Behind The Wheel) slightly less easy to follow, but it grew on me. Clearly this was generous gift to the band, the vocal content taking a step back and allowing the band to demonstrate their skill, with Sanna blending in her vocal as another component. It may be one for the lovers of pure free-form improvisational jazz, although it contains some fantastic sax and trumpet soloing. It is a bit more ‘out there’ even though it is clearly still structured and tightly rehearsed. This album is worth hearing if only for the interaction between the drums and piano at the beginning of the closing track, Solivagant, and for the moment the bass kicks in, and that voice. Capturing the sadness of loneliness, as this track came to a close it left me sitting in contemplative silence. Sublime. That’s why I’m singling out this as my stand-out track. Overall, Start from Nothing made me smile. I missed Sanna Rouhoniemi’s critically acclaimed debut album Tales of a Stranger (Eclipse Music 2016) but I will be sure to seek it out and follow her musical journey with interest.